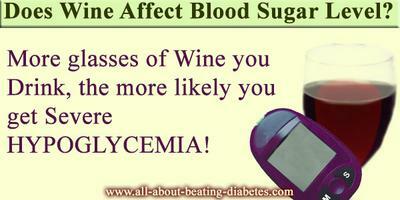 I'm a diabetic, does wine raise or lower my blood sugar level? QUESTION: I'm a diabetic, does wine raise or lower my blood sugar level? That is a very good question and every diabetic or pre-diabetic has to know the answer in purpose to preserve his/her health. First, all beverages which contain alcohol are having a great glucose load. That means that during their metabolism, they are discharging this glucose, which causes elevation of the blood glucose level. However, the amount of the glucose in the alcohol is not that big to cause severe blood glucose elevation and this elevation is observed during the first 10-15 minutes after the consumption of alcohol. Second, besides the glucose load, the alcohol is containing substances, which are stimulating the secretion and the effect of insulin. As you probably know, insulin is a hormone which is reducing the blood glucose level by putting some of the glucose inside the cells. Because of this fact, when the secretion of insulin is increased, more glucose is going to enter inside the cells. This will cause severe reduction of the blood glucose level – hypoglycemia, observed 30 minutes after consumption of alcohol. To your information, the early signs of hypoglycemia include palpitations, sweating, nervousness and others. If you notice some of these symptoms, no matter before or after the wine consumption, you have to eat something sweet quickly. Besides, you can put it under your tongue, for faster blood glucose elevation. It is important to know that in some cases the blood glucose concentration can drop to dangerous levels, especially in diabetics. This is very dangerous and life-threatening condition, which requires instant medical attention. Regarding wine, it is containing a lot of glucose and moderate amount of alcohol. Because of the moderate amount of alcohol, you might drink one glass of wine. Remember not to drink wine, or any other alcohol, at empty stomach, because this is increasing the risk for hypoglycemia.